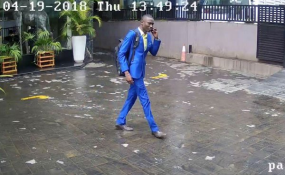 One of the photos released by Directorate of Criminal Investigations on social media of four suspects who have allegedly been stealing laptops from unsuspecting people at meetings in Nairobi. Isaiah Aluodo Belek passes for a regular well-to-do city gentleman. In his trademark blue suit, cut to fit, and well-pressed yellow shirt, Mr Aluodo radiates nothing short of elegance. A newspaper in hand completes his dandified look. It is almost absurd to suspect "Izo" of any mischief, until mischief happens. Izo has a refined sleight of hand, sticky fingers if you may. Stealing laptop computers is his stock in trade. Mr Aluodo is part of a notorious gang of laptop thieves in the city who were arrested last Friday and their mugshots published by the Directorate of Criminal Investigations (DCI) in Kilimani. Fourteen stolen laptops were also recovered from them. It all started on Friday afternoon when security guards at Nairobi Hospital grew suspicious of Mr Aluodo when he entered the premises. They identified him as the man in the photos the DCI had circulated on social media. "We had been trailing the suspects for a while for various crimes involving laptop thefts. It was, therefore, easy for the guards to identify him and raise alarm. We went there and arrested him for questioning," Kilimani OCPD Michael Muchiri told the Nation. According to Mr Muchiri, Mr Aluodo admitted to having an accomplice at Nairobi's South B estate. Officers raided the house, recovered one new laptop that had been stolen and arrested Mr Amisi Erick. "The two then led our officers to Imenti House, where two other suspects -- Mr George Njagi Maina and Mr Kevin Njagi Kariuki -- were arrested. They had 13 stolen laptops in their possession," Muchiri said. The suspects then narrated how they rebrand and repackage stolen laptops using new polythene bags before displaying them at various outlets across the city and sell them as new gadgets. "Such is the extent of rot in the computer business. The underworld of laptop business in Nairobi is very huge," the OCPD said. Your new laptop might just be an old stolen device that was rebranded to give it its sheen. According to Kilimani DCIO Fatuma Hadi Abdi, the quartet has been stealing the gadgets from unsuspecting victims attending meetings, conference and seminars in city hotels, from offices, hospitals and restaurants. The most notorious and recognisable of the four suspects is Izo, who used to steal pens and textbooks from his classmates at a secondary school in Nairobi, according to his former schoolmates. Ms Hadi said this suspect has been captured in footage for at least 20 different times by CCTV cameras while entering and leaving various hotels in the city. But how do these criminals conduct their activities? The DCIO said that a member of the gang gains access into a meeting room like genuine attendees and sits through the session as he plans to make away with the targeted items. At a restaurant, he cuts the figure of a regular patron minding his own business, while quietly nursing his mug of hot chocolate or steak and chips. He lays in wait, never in haste to strike. This is a delicate game of dexterity, but mostly of practised patience. When the revellers lose themselves in merry, he goes for the kill. He takes the victim's laptop bag, repacks the gadget in a different bag and is ready for flight. In a whiff, he pilfers through the front door, without raising the slenderest shred of suspicion. And just like that, you are separated from your laptop. Nimble. Subtle. Clinical. It is still hazy how long for this gang has been operating, the size of the syndicate, or the extent of their activities. But going by the number of laptops that are stolen in the city on a daily basis, this is a deep-seated rot. Universities and other academic institutions are the other major hotspots, with students involved in the dark business. A victim of phone theft, Oita Etyang, said Mr Amisi started by stealing petty things from residents of South B estate. Mr George Mwangi Maina, 30, operates a laptop repair shop at Imenti House along Tom Mboya Street. He also goes by the name Muturi. The suspects were arraigned in court yesterday with charges of stealing laptops and being in possession of stolen items.